"Once you hear the freight break loose and start sliding, there's absolutely nothing you can do. You can kiss your behind goodbye." Walter Price is a veteran truck driver who has lived to describe every truck driver’s worst nightmare, the absolute terror behind the wheel of a big-wheeler as you lose control and head into a rollover. He had just taken an exit ramp off the Interstate 75 near Atlanta, when a little black car darted in front of him and caused him to brake hard on the already sharp curve in order to avoid a collision. As Price's quick response certainly saved the motorist's life, he nearly lost his own when the sudden move caused his 36-ton rig to rollover into the bank below. The little car simply continued on its way and the driver never got charged. 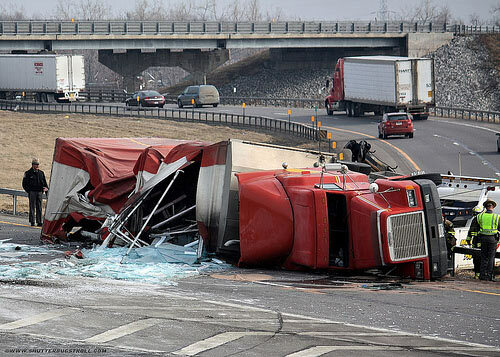 Every year hundreds of US truck drivers die from all the factors creating this deadly scenario. A deteriorating interstate highway system with archaic exit ramps, no longer able to accommodate the increasingly congested roadways and more billion ton loads of the booming trucking industry. 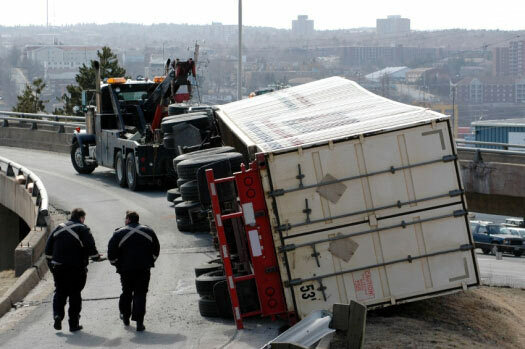 In fact, the most recent data from 2012 indicated there were approximately 300 truck occupant deaths and 3,000 injuries due to rollovers now occurring every year and while fatigued and distracted truck drivers have certainly been the most publicized source to blame, the other major factors of outdated roads and equipment are finally starting to be addressed. Steve Niswander, Vice President of Safety Policy at the Groendyke Transport trucking company in Oklahoma sums it up with a simple explanation. "Because so many curves were made 40 years ago, they don't have the banking needed for the trucks of today. But to lengthen out and expand cloverleaves in probably 50 areas in the United States would take billions," he said. And with the 10 billion tons of annual freight now taking such a toll on the nation's highways but necessary for the nation's booming economy, politicians on both sides are coming together in a bipartisan effort to find the money to fix them. Even Michigan’s Republican governor Rick Snyder, has recently endorsed a ballot to raise his state’s sales tax in order to repair the "rotten roads and bridges." Iowa's Republican governor is also considering higher taxes to cover road repairs in his state as well. However, John Woodrooffee of the University of Michigan Transportation Research Institute explains that truck engineering also needs to be updated in order to prevent truck driver deaths. "Rollovers can be quite violent at the last phase of it. The trailer goes over first, and then it can wind up like a spring and snap the cab over. Ejection or partial ejection from the cab are the highest causes of death," he said. Last month, Woodrooffee's research was included with the National Highway Traffic Safety Administration's proposal to the White House to mandate electronic stability control to take over braking on big trucks. While the NHTSA stated that this newer technology could save 60 lives each year and prevent 2,329 crashes, the trucking industry opposition has been trying to prevent the regulation from going through because of the obvious costs of updating fleets to comply with these mandated systems. Woodrooffee says that this delay is costing us lives, but Ted Scott, director of engineering for the American Trucking Associations, disagrees. He says that truckmakers already equip about 70 percent of new rigs with some form of stability control and that mandating the more costly electronic technology isn’t going to make that much of a difference. "I don't think the mandate is going to change a damn thing until all of the older tractors are off the road," Scott said. Have you ever experienced a rollover? What do you think would be the most effective solution for preventing them? He should have a dash cam, or got a good piece of the motorist before ending up rolled over. I thought Obama ' s plan the 1st time he ran for president was to improve and upgrade our roadways. Not go from #1 in the world to #16?? ?